We catch up with Peter Blyth of Clifton Stud based in Rosetta. Peter has had a lifetime with horses in various disciplines including polo, racing and breeding. He is assisted on the farm by his wife Jenny and Manager Christine Quinn. Another little known fact is young and upcoming jockey Luke Ferraris is the nephew of Peter and Jenny. How long have you been involved in the breeding of racehorses? Clifton stud has bred racehorses since 1945 by my father. What is the most enjoyable and rewarding part of your work? Watching the horses we have bred win at the races. I would say accepting the disappointments at sales can be a hard pill to swallow after planning matings and ensuring the horse gets to the sales with significant condition and expense. When did the horse bug bite and how did you get involved with breeding Thoroughbreds? My father bred race horses, as a hobby, so I grew up in the business. Whereabouts is your farm situated? 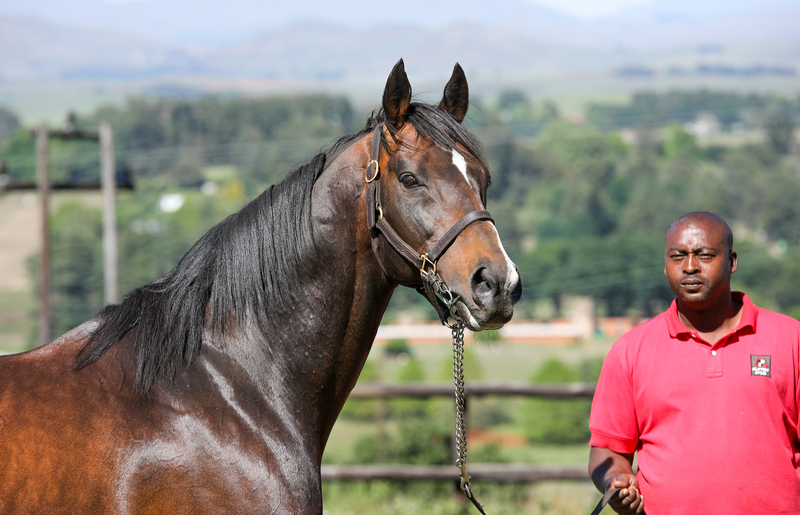 Clifton Stud is currently situated 2,5 kms from Rosetta and 15 kms from Mooi River. Tell us about your staff? Having moved Clifton Stud from our family farm near Lothair in Mpumalanga ten years ago, we had to retrench all my old staff. Many had worked for me all of my life. 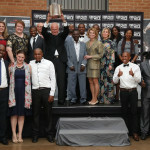 Our new staff are currently with us for the ten years we have been breeding here in KZN. Best horses you have bred? Classic Flag, the 1998 Durban July winner and Horse of the year in South Africa, trained by my brother in law David Ferraris. Our other special horses include Fort Vogue, Bezanova, What A Lady, Olympic Flag, Glenrossal, Covered in Snow, Duffi’s Call and Royal Desire. Do you follow your horses racing careers after they are sold? Yes definitely. One must know the results of the progeny so as to know whether to continue breeding with the mare and the sire. Do you have any of your own horses in training now? Yes I do. 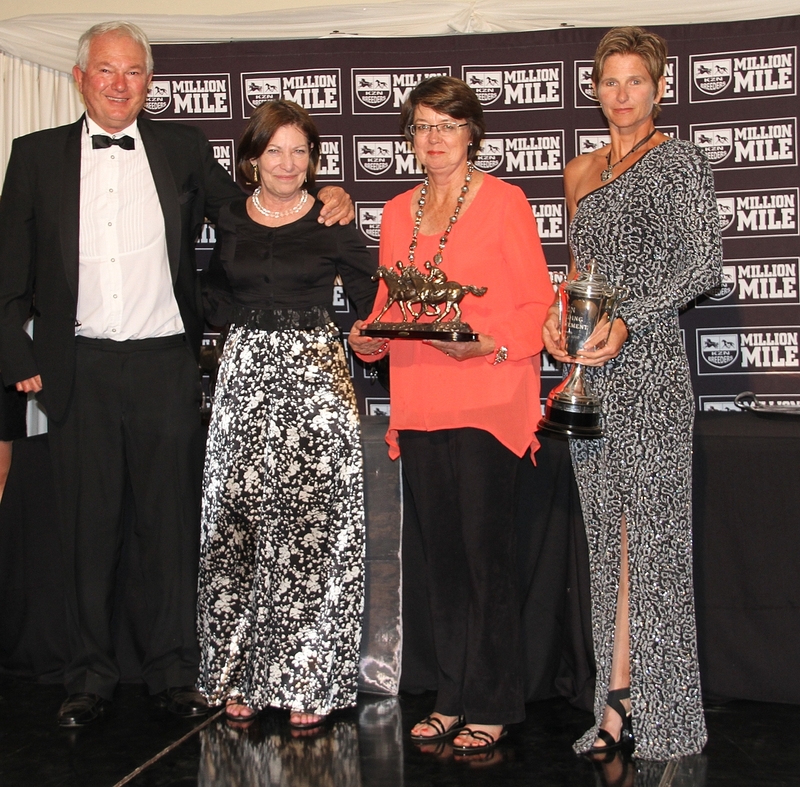 We had a lovely recent win with partners in the Kahal mare Rose Of Peru. Tell us about how many mares you have currently on the farm and stallions? 60 mares and two stallions, Crusade and Mambo in Seattle. Which stallions currently are exciting you the most? 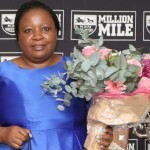 Mambo in Seattle who has produced many Gr1 horses including Same Jurisdication and recent export Majestic Mambo, and Flying the Flag in KZN. His two full sisters are both Gr1 winners with Coolmore and his foals are very impressive. Which foals stand out for you this season? We have a few! Crusade x Blue Nevada, Capetown Noir x Miss Coco, Willow Magic x Demitasse, Duke of Marmalade x Harold’s Gold, Capetown Noir x Irish Fairy & Irresistable Chris and Noordhoek Princess. Any special yearlings to look out for next year at the sales and are there any specific sales that you like to support? 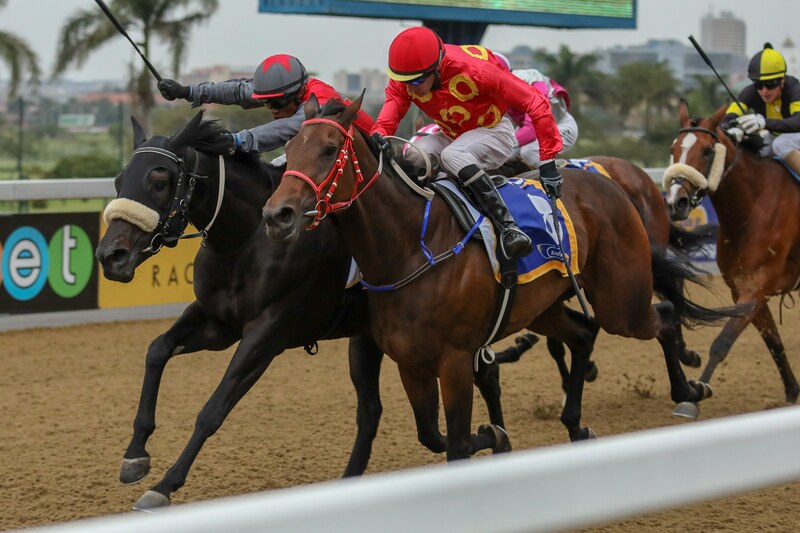 Our special yearlings for 2019 include Crusade x Casey’s Dance, Flying the Flag x Sauna’s Rose, Ideal World x Mystic Rose, Flying the Flag x Star Silvano, Capetown Noir x Miss Coco. 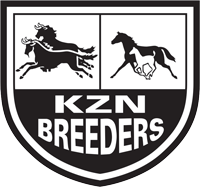 We like to support the National Yearling Sale, our regional KZN Yearling Sale and 2 Year Old Sales. 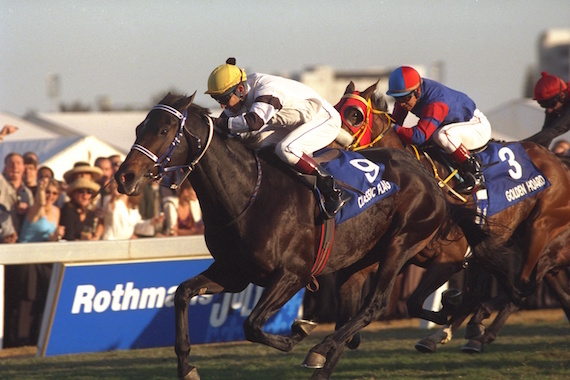 Classic Flag wins the 1998 Durban July. Tell us about what goes into planning your matings each year – physical, pedigree etc, what do you think is most important to breed the perfect specimen? The most commercial option, but physically mare and sire must compliment each other. Tell us something about you that most people dont know? Very shy with massive hang ups!! What are your interests or hobbies outside of work? 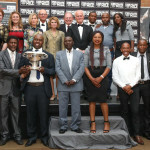 Sport, wild life and going to the most remote places in the bush. A lighthearted, feel good or amusing story to add? Having had the pleasure of doing the physical matings to the stallion, then delivering the resulting foals, rearing them, breaking them in, training them, saddling them up at the races and then leading some of them in as winners into the winners enclosure. So thrilling!! An amusing story: doing summersaults next my polo pony, having been tripped up, and my pony was also summersaulting next to me at the Inanda polo ground in Jhb. Everyone stopped playing in fits of laughter because it looked so funny!! One of my feel good moments was winning the Transvaal Polo Champs in 1971 for our home club called New Scotland Polo Club, situated on our old farm in Ermelo. I grew up with Peter in Lothair and know Jenny from a very young age too. Super couple who work so hard and always welcome you with open arms. Peter, you have amazing knowledge of horses and farming in general, a wonderful sense of humour, jolly good tennis player and not a bad dancer!!! So proud of you both. It thrills me to see you are still breeding horses Peter and Jenny, keep up the great work. I certainly have fond moments of Inada polo club myself. The goal posts used to be made of strips of bamboo very cleverly made. It looked great, but you did not want to go into it. Unfortunately I went into it with my knee and totally uprooted the goal post. I certainly enjoyed the horses I got from you and played polo on them. Grain of Gold was my favourite polo pony. Keep up the great work Peter, and look forward to seeing you in the winning enclosure more often. When I watch many horse stories like “Secretariat” I find myself crying in all of them as I identify with the characters in the film. Keep well and strong.